The new O rack by Mahaffy and DeGreeve. 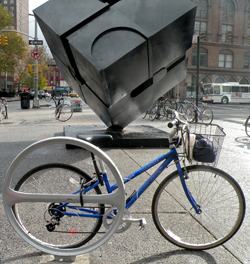 Yesterday, the winner of New York’s bike rack competition was announced and the winning design, by Ian Mahaffy and Maarten De Greeve of Copenhagen, Denmark (the most bicycle friendly city on the planet) is a refreshingly simple, functional looking O. (I say functional looking, because you never really know how well any bike rack works until you actually try to secure your bike to it with one of the cumbersome medieval devices that pass for bike locks in this town.) At any other time, I’d have said that the circle with the crossbar is a revival of the ecology symbol popular in the 1970s, but in November of 2008, the O has an entirely different significance. Soon there will be 5000 of these Os all over town. With Big Os everywhere, it’s no wonder that we’re still wandering the city suffused in a post-electoral glow. I guess that’s why they call it a honeymoon. Enjoy it while it lasts. The O flag by Paula Scher of Pentagram.